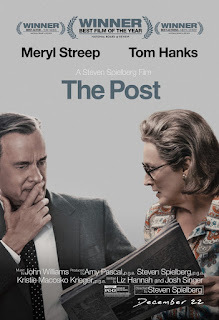 "The Post' has Steven Spielberg directing, with Tom Hanks and Meryl Streep acting: What more do you want? They tell the story of the publication of the Pentagon Papers in 1971, a government study proving those behind the Vietnam War knew the American effort was doomed, while insisting the opposite in public. Daniel Ellsberg leaks the report to the New York Times. The government files suit, preventing further publication. Ellsberg's friends deliver the papers to the Washington Post. Editor Ben Bradlee, played by Tom Hanks, smells a chance to make the Post a national player. Katherine Graham, played by Meryl Streep, isn't so sure. It all happens, as she goes to Wall Street to list the Post Company on the stock exchange. What if the government comes after her? What if she loses the family fortune? "The Post" has much of the tension and drama that made both "Spotlight" and "All the President's Men" so powerful. It lacks the reporter detective work of those two films, relying instead on the relationship between Bradlee and Graham. As a director, Steven Spielberg gets preachy, even heavy-handed. But any irritation I had, vanished during a scene in which a reporter sits at his typewriter. Just then, the presses roll and the entire building shakes. That's old school, and it's great. "The Post" 3½ stars, rated PG-13. Does it deliver what it promises? Crusading newspaper story. Is it entertaining? Great workplace drama. It is worth the price of admission? I recommend it.